In the wake of U.S. President Trump’s discriminatory travel ban in February 2017, an online campaign called #LoveBeyondFlags was launched, in part, by Iranian Twitter. It was a pacifistic protest of the Trump administration’s antagonistic executive legislation and the See You in Iran community joined in solidarity. A flood of #LoveBeyondFlags posts descended on the group around Valentine’s Day and the Zoroastrian holiday Sepandarmazgan. “Let’s blur the hallmark consumerism of Valentine’s Day and the reactionary nationalism of Sepandarmazgan and instead bridge the two with pictures/stories showing no matter what religion, country, culture we are from, what we all support is LOVE NOT WAR,” wrote Facebook group admin Mahsa Vafai. Members collectively combatted Iranophobia with images set in Iran and messages promoting borderless friendship. 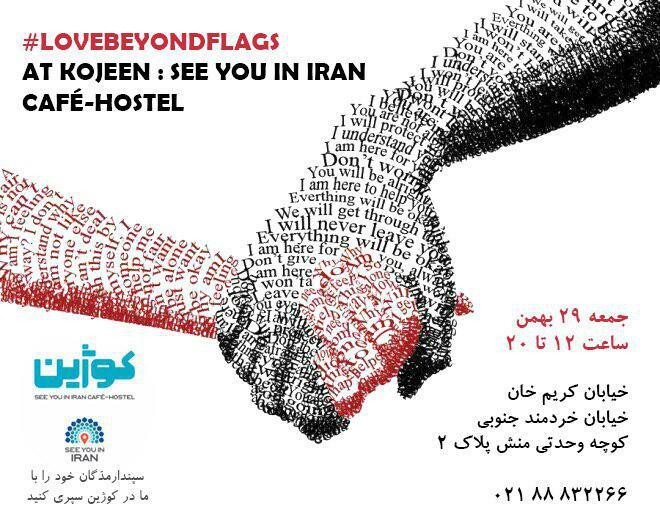 Tens of #LoveBeyondFlags posts celebrating love and allyship were curated and showcased via powerpoint at the See You in Iran Hostel. The presentation was accompanied by live traditional Iranian music for an inviting event on connecting in resistance to fear.